Earth Engine is free to use for research, education, and nonprofit use. To access this dataset in Earth Engine, please sign up for Earth Engine then return to this page. Sentinel-5 Precursor is a satellite launched on 13 October 2017 by the European Space Agency to monitor air pollution. The onboard sensor is frequently referred to as Tropomi (TROPOspheric Monitoring Instrument). All of the S5P datasets have two versions: Near Real-Time (NRTI) and Offline (OFFL). The NRTI assets cover a smaller area than the OFFL assets, but appear more quickly after acquisition. The OFFL assets contain data from a single orbit (which, due to half the earth being dark, contains data only for a single hemisphere). The original Sentinel 5P Level 2 (L2) data is binned by time, not by latitude/longitude. To make it possible to ingest the data into Earth Engine, each Sentinel 5P L2 product is converted to L3, keeping a single grid per orbit (that is, no aggregation across products is performed). Source products spanning the antimeridian are ingested as two Earth Engine assets, with suffixes _1 and _2. The conversion to L3 is done by the harpconvert tool using the bin_spatial operation. The source data is filtered to remove any values with QA values of less than 50. 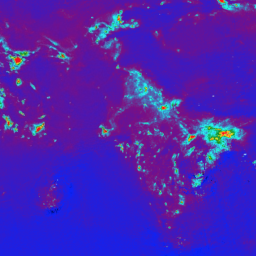 This dataset provides near real-time high-resolution imagery of NO2 concentrations. To make our NRTI L3 products, we use harpconvert to grid the data. Total vertical column of NO2 (ratio of the slant column density of NO2 and the total air mass factor). Aerosol index (at wavelengths 354/388, i.e. the OMI pair) from the AER_AI level 2 product. See Level 2 Algorithms - Aerosol Index. Effective cloud fraction. See the Sentinel 5P L2 Input/Output Data Definition Spec, p.220. Altitude of the satellite with respect to the geodetic sub-satellite point (WGS84). Azimuth angle of the satellite at the ground pixel location (WGS84); angle measured East-of-North. Zenith angle of the satellite at the ground pixel location (WGS84); angle measured away from the vertical. Azimuth angle of the Sun at the ground pixel location (WGS84); angle measured East-of-North. The algorithm version used in L2 processing. It's separate from the processor (framework) version, to accommodate different release schedules for different products. The date, expressed as milliseconds since 1 Jan 1970, when the software used to perform L2 processing was built. The version of the HARP tool used to grid the L2 data into an L3 product. The institution where data processing from L1 to L2 was performed. The date, expressed as milliseconds since 1 Jan 1970, when Google processed the L2 data into L3 using harpconvert. The maximum latitude of the asset (degrees). The minimum latitude of the asset (degrees). The maximum longitude of the asset (degrees). The minimum longitude of the asset (degrees). The orbit number of the satellite when the data was acquired. Name of the platform which acquired the data. The processing status of the product on a global level, mainly based on the availability of auxiliary input data. Possible values are "Nominal" and "Degraded". The version of the software used for L2 processing, as a string of the form "major.minor.patch". Id of the L2 product used to generate this asset. Indicator that specifies whether the product quality is degraded or not. Allowed values are "Degraded" and "Nominal". Revision control system identifier for the source code of the software used for L2 processing of this data. Name of the sensor which acquired the data. Spatial resolution at nadir. For most products this is 3.5x7km2, except for L2__O3__PR, which uses 28x21km2, and L2__CO____ and L2__CH4___, which both use 7x7km2. This attribute originates from the CCI standard. Days from 1 Jan 1950 to when the data was acquired. The Julian day number when the data was acquired. UUID for the L2 product file.